We have thought of all the details to make the experience like travelling first class on a plane (but less stuffy). There are nice little touches and surprises whilst you’re with us. For instance, you get to spend time in a massage chair whilst we wash your hair, there is a hot moisturising towel treatment during your second rinse (we wash your hair again after we have cut your hair), you can choose from a wide selection of drinks from beer, Gin and Tonic to fruit tea or really good coffee. The chat is usually good, and the tunes are decent. 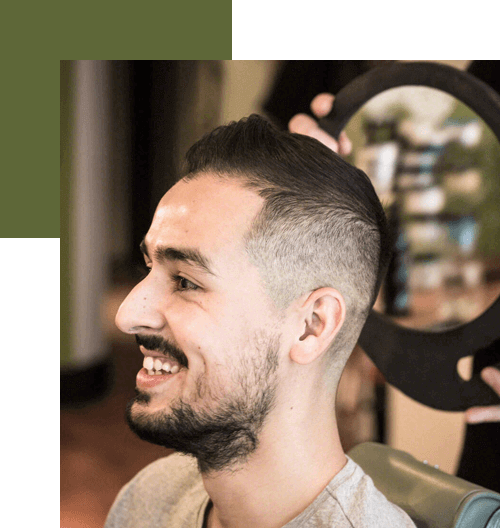 To give you a little incentive to try us, you can have your first mens haircut for 25% off the normal senior stylist price. Just complete our online form below, and we will send you your 25% First Cut Discount Voucher via email immediately. It will arrive straight away so you can use it today. Just print it out the email and accompanying voucher and bring it in with you when you come in to see us. A camouflage treatment designed to cover grey hairs. 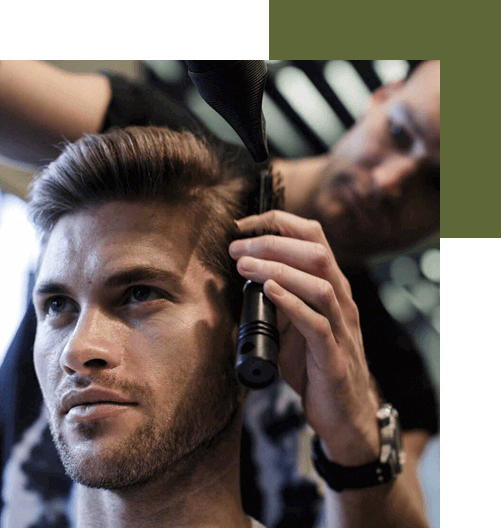 The treatment takes 30 mins and we match to the natural colour of your hair. The treatment is very subtle, doesn’t completely cover greys but lessens the appearance of greys, and others will not notice that your hair has been coloured. It is a semi-permanent colour so it gradually fades over the course of 4-6 weeks after which we re-apply the colour. PLEASE NOTE THAT WE WILL CHECK WHETHER YOU ARE ALLERGIC TO THE PRODUCTS WE USE BY PLACING A SMALL AMOUNT BEHIND YOUR EAR. WE WILL THEN ASK YOU TO RETURN AFTER 48 HOURS. IF THERE IS NO ALLERGIC REACTION ONLY THEN WILL WE PROCEED WITH THE TREATMENT.